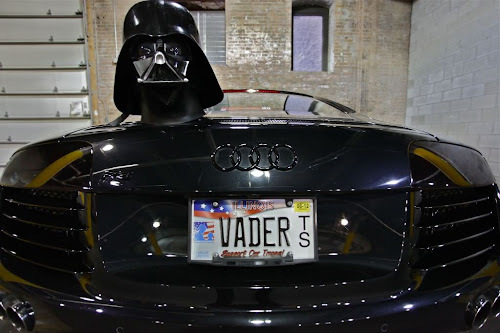 Our friend Ray has recently listed his "Darth Vader'd out" 2009 Audi R8 on eBay and we figured some of our readers may be interested in the car. If you recall, last year we posted a video we titled "75 year old woman loves her Audi R8." Unbeknownst to us at the time, the woman is Ray's mom and the car she was driving was actually his. This blacked out 2009 Audi R8 4.2 FSI 6MT, is that car. Optional equipment from the factory includes an 'enhanced leather' carbon interior, carbon side blades, premium package and Bang & Olufsen sound system. Then, to complete Ray's "Vader" theme, everything was blacked out (including the wheels, windows, taillights, headllights, turn signals, badges and "anything else that was chrome/silver"). Topping off the project is an ultra-rare (and very expensive) Kreissieg electronic variable tune exhaust system and K40 Calibre integrated radar the help keep the Jedi off your tail. The video below should convey the awesomeness of the Kreissieg exhaust in action. As reported on eBay, this R8 has just 9,700 miles and comes with the original factory warranty valid until Feb. 2013 (or 50k miles) and Audicare til Dec. 2014. For those seriously interested in purchasing this car, please email us here and we'll pass on any questions you may have to the owner. Click here to view the original listing on eBay.